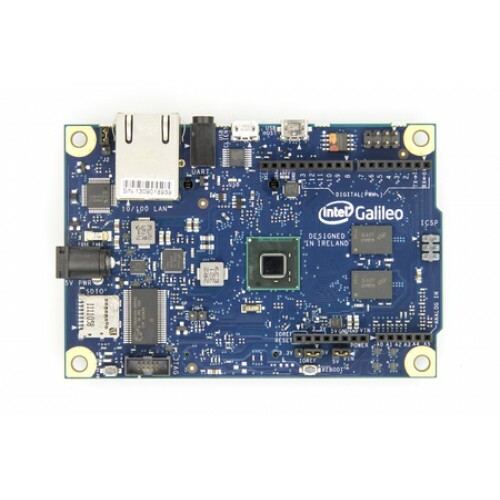 The Intel® Galileo board is based on the Intel® Quark SoC X1000, a 32-bit Intel Pentium®-class system on a chip (SoC). It is the first board based on Intel® architecture designed to be hardware and software pin-compatible with shields designed for the Arduino Uno R3. This platform provides the ease of Intel architecture development through support for the Microsoft Windows*, Mac OS*, and Linux* host operating systems. It also brings the simplicity of the Arduino integrated development environment (IDE) software. The Galileo board is also software-compatible with the Arduino Software Development Environment, which makes getting started a snap. In addition to Arduino hardware and software compatibility, the Galileo board has several PC industry standard I/O ports and features to expand native usage and capabilities beyond the Arduino shield ecosystem. A full sized mini-PCI Express slot, 100Mb Ethernet port, Micro-SD slot, RS-232 serial port, USB Host port, USB Client Port, and 8 MByte NOR flash come standard on the board. The genuine Intel processor and surrounding native I/O capabilities of the SoC provides for a fully featured offering for both the maker community and students alike. It will also be useful to professional developers who are looking for a simple and cost effective development environment to the more complex Intel® Atom™ processor and Intel® Core™ processor-based designs.